Russia’s Soyuz rocket took to the skies in a new setting on Thursday, conducting the inaugural launch from the Vostochny Cosmodrome in the far eastern region of the country. Thundering into clear skies above the new launch base, Soyuz headed towards a polar orbit for the delivery of three multi-functional satellites on technical demonstration and science missions. With high-ranking officials – including President Vladimir Putin – in attendance, Soyuz lifted off on time at 2:01 UTC, 11:01a.m. local time on a trek across the Russian territory to reach a high-inclination orbit. The 46-meter tall rocket successfully fired its three stages as part of a standard ascent profile, taking nine minutes from liftoff to the separation of the Volga upper stage – flying for the first time on a Soyuz 2-1A rocket. It was up to Volga to finish lifting the three satellites to their intended orbits in a mission with two upper stage burns. Riding side by side atop a payload dispenser were the Lomonosov research satellite from Moscow State University and AIST-2D technical demonstration and science spacecraft developed in Samara by TsSKB Progress and Samara State Aerospace University. The two satellites, along with a small CubeSat, were successfully deployed into a Sun Synchronous Orbit two hours after launch while the Volga stage was to finish its mission by making a targeted re-entry in the Pacific Ocean seven hours after liftoff. The Vostochny launch base in Siberia was approved as a project in 2007 and Vladimir Putin personally took charge and, on multiple occasions, emphasized the importance of the creation of a new space center. 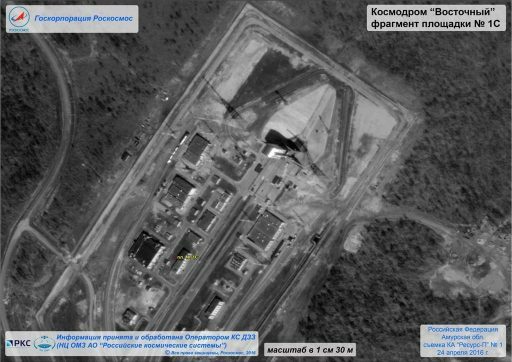 Putin ordered paperwork to be accelerated to pave the way for construction to begin on the grounds of the closed Svobodny missile base in early 2011. At the time, Vostochny was expected to be fully operational by 2018, but the project was plagued by delays, unpaid wages and alleged cases of corruption – taking an initially planned 2015 launch out of the question. The primary rationale behind building a new Cosmodrome was reducing Russia’s dependency on the Baikonur Cosmodrome under lease from Kazakhstan for an annual payment of $115 million. 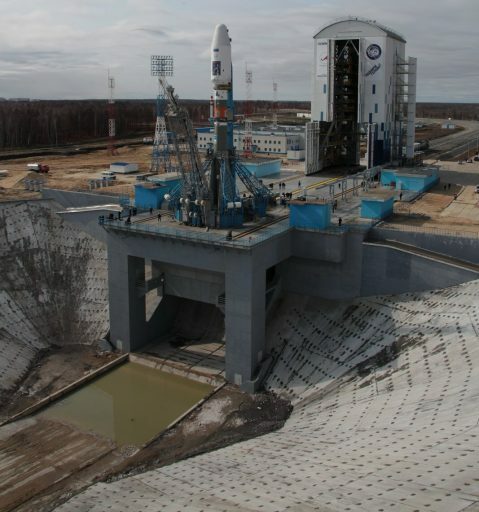 Vostochny comes at a price tag of nearly $3 billion, of which $1.8 billion have already been spent on the construction of the Soyuz launch facility and Cosmodrome support facilities and infrastructure. When finished, Vostochny will host launch facilities for Soyuz launchers covering the light and medium-lift business, and the Angara rocket capable of flying in different configurations to cater to all types of payloads up to super-heavy lift capability. The first Angara launch from Vostochny is currently on the books for 2021 and a first crewed launch using Russia’s new Federation spacecraft could come as early as 2023. Until then, all crewed flights will continue relying on the trusted Soyuz rocket and spacecraft combination operated from the Baikonur Cosmodrome. 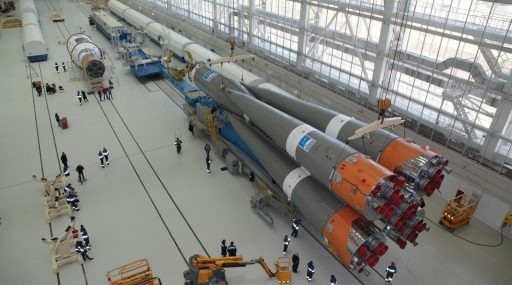 Baikonur will continue to support the heavy-lift Proton until its retirement in the 2020s and Soyuz will keep flying from the historic launch site for the foreseeable future as Russia’s lease with Kazakhstan extends through 2050. For the near-term, Vostochny is looking at a rather empty manifest. 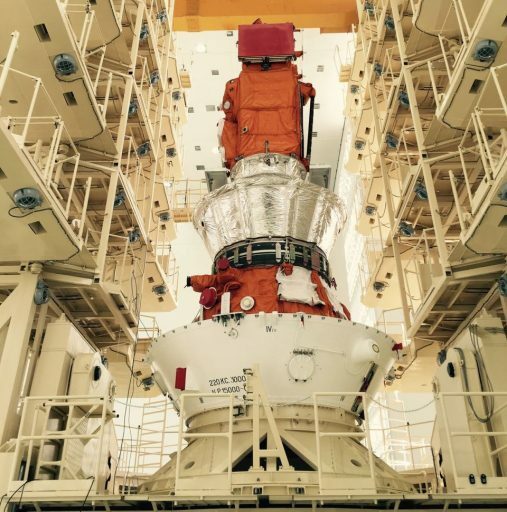 The next flight planned from the eastern Cosmodrome will be a mission for the Russian Ministry of Defence in mid to late 2017 and up to half a dozen of the 21 Soyuz launches dedicated to the OneWeb Internet Satellite constellation could be carried out from Vostochny in 2018/19. Russia plans to shift around half its orbital launches to Vostochny in the early 2020s when Angara becomes operational. The first Soyuz rocket arrived at Vostochny in September 2015 and was kept in shipping containers while the finishing touches were put on the new Processing Facility and the last concrete was poured in the launch pad’s cavernous flame trench. Assembled in January, the Soyuz was rolled over to its launch pad in late March for a week of fit checks and extensive testing of ground systems at the launch base. Setting up for Vostochny’s premiere launch, the Soyuz – topped by its three satellite payloads tucked into its payload fairing – emerged from the processing hall at the traditional early morning hour on Saturday. Riding on rails to its concrete pad, Soyuz was raised to its vertical launch position and the Mobile Service Gantry was moved in position over the vehicle – similar in design to the structure used in French Guiana, the second modern-era Soyuz launch pad in contrast to the facilities in Plesetsk and Baikonur with their fold-up Service Structures. An initial launch attempt on Wednesday resulted in a last-minute abort of the Automated Countdown Sequence with about 90 seconds to liftoff. The automatic abort was triggered by a faulty switch that failed to signal the closure of a propellant valve on the Block I third stage to the Flight Control System. A component was replaced and Soyuz was cleared for another try on Thursday. 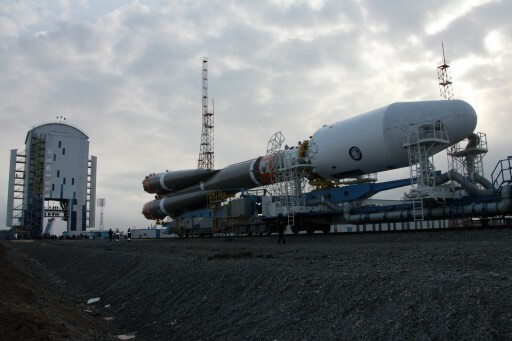 The routine schedule for Soyuz countdown operations – normally a well-oiled machine with over 1,800 vehicles flown in a five-decade program – was changed up for the maiden launch from Vostochny. Clearance for propellant loading was given by the Russian State Commission after a clean review of launch vehicle tests and Soyuz headed into tanking at 18:30 UTC on Wednesday, about four hours earlier than in a normal launch operation. The timeline of the fueling sequence was decompressed to insert a cushion of around four hours in case any adjustments to ground systems would be needed as this was the first time the propellant handling systems were being exercised for a launch countdown. Over the course of two and a half hours, the 12 tanks on the Soyuz were filled with over 274 metric tons of -183°C Liquid Oxygen and Kerosene while the boosters and Core Stage also received Liquid Nitrogen to act as pressurization gas in flight. Hydrogen Peroxide was filled into tanks on the core and boosters in the early part of the countdown to drive the engine turbopumps. When Kerosene was at flight level, hoses and tanking equipment was removed and stowed while Liquid Oxygen and Nitrogen entered an extended replenish given the different timeline of the countdown. With tanking completed without any significant teething problems of the new launch pad, the countdown entered a holding pattern to catch up with the nominal timeline, featuring a detailed set of checks on the Soyuz and its Volga upper stage inside L-2 hours. 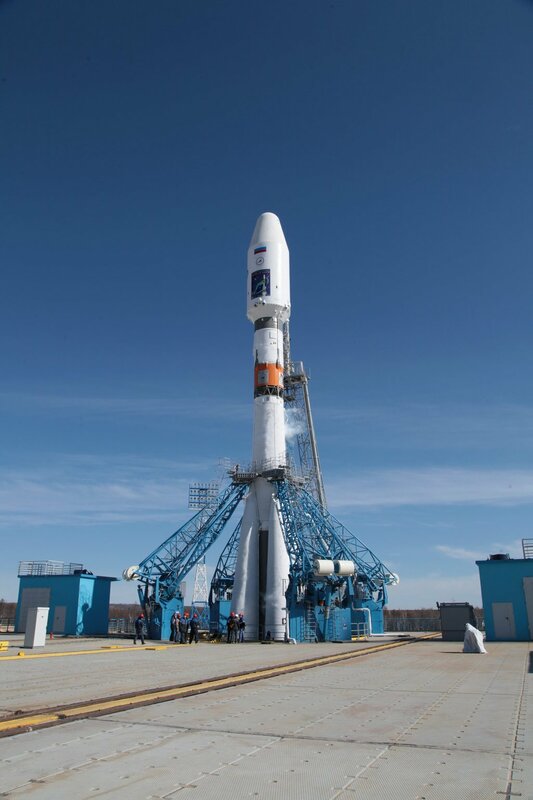 Volga had received its flight parameters earlier and was under constant watch by teams, as was the Soyuz rocket which completed its flight software load later on. The Mobile Service Gantry began moving at L-70 minutes, retracting to a safe distance for liftoff and clearing the way for final radio and telemetry checks with the Soyuz and the evacuation of the complex when the last close outs were complete. With a clean bill of health, Soyuz pressed into its critical Automated Countdown Sequence to pressurize its tanks, purge its engines and enable its telemetry systems. Volga switched to battery power and Soyuz followed suit at T-1 minute when its computers assumed control of the countdown. The Third Stage Umbilical Mast disconnected from the vehicle and moved away to its launch position and Soyuz issued its launch command at T-20 seconds, coinciding with the retraction of Core Stage umbilical. Flames erupted from the base of the rocket when Soyuz fired its engine igniters and all turbopumps soared to flight speed, injecting propellants into the multi-chamber engines of the boosters and core stage. 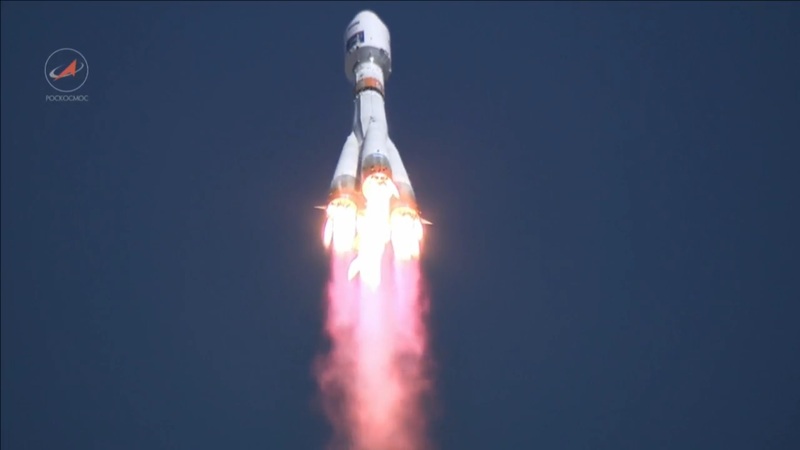 Throttling to a total launch thrust of 422 metric-ton force, Soyuz overcame counterweights to start rising from its pad. Liftoff occurred at 02:01:21 UTC when Soyuz started climbing from its new launch pad – the eighth Soyuz pad ever constructed and currently one of five active Soyuz launch sites across the globe. Under the eyes of Russia’s top officials, Soyuz completed a short vertical climb-out before pitching over and rolling onto a path taking it to the north-west, starting to home in on a polar orbit. Racing into a cloudless sky, Soyuz encountered Maximum Dynamic Pressure and quickly pushed through the speed of sound, its engines guzzling down 1,600 Kilograms of propellants per second. The four boosters helped accelerate the vehicle to over 1.5 Kilometers per second, shutting down their RD-107A engines one minute and 58 seconds into the flight after each burned through 39,600 Kilograms of Oxygen and Kerosene. Upon shutdown, the 19.6-meter long boosters were jettisoned and swung outward, away from the vehicle to ultimately head for an impact 360 Kilometers from the launch site. Starting to make progress downrange, Soyuz relied on its core stage alone to continue powered flight with a thrust of 102,000 Kilogram-force when flying in the outermost layers of the atmosphere. 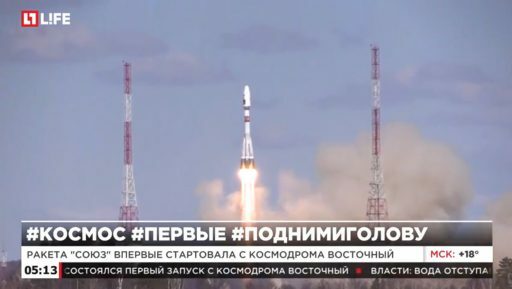 As Soyuz began flying over the Russian countryside, engineers were counting on the Скут-40 onboard measurement and telemetry system with a wide range of 2,000 Kilometers to provide an uninterrupted stream of telemetry even when Soyuz was flying over areas with sparse ground station coverage. The protective payload fairing split open and separated three and a half minutes into the mission, exposing the Lomonosov and AIST-2D satellites, riding side by side into orbit atop their Volga upper stage. Finishing its burn at T+4 minutes and 45 seconds, the Core Stage consumed over 91 metric tons of propellant to send the vehicle on its way. 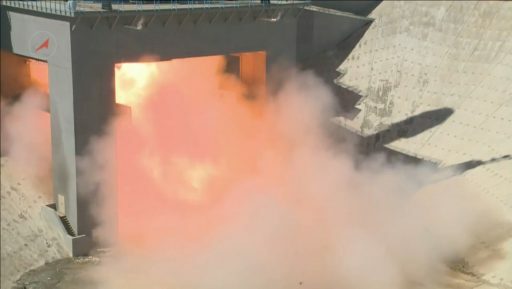 Separation of the stages was completed two seconds after engine shutdown on the core, making use of the typical hot-staging architecture with the RD-0110 igniting moments before the pyrotechnic stage separation system was fired. With the 27.8-meter long core stage on its way back to Earth, the third stage embarked on the last leg for the Soyuz – firing its four-chamber RD-0110 for a four-minute burn, generating 30,400 Kilogram-force of thrust. The Block I stage shut down its engine eight minutes and 46 seconds after liftoff and the Volga upper stage separated two seconds later – marking the completion of the Soyuz mission and the start of a multi-burn Volga flight to deliver its three payloads. Delivered to an elliptical Parking Orbit, Volga was to start out by stabilizing its orientation before heading into coast mode for around half an orbit to set up for the first burn of the 2.94-Kilonewton engine installed on the upper stage. The first Volga burn will further raise the high-point of the orbit to match the target altitude of the satellites just over 500 Kilometers. After the completion of the first burn, Volga will again coast for half a lap around Earth so that the second burn can take place at apogee and bring up the perigee altitude to circularize the orbit. The first satellite to depart the vehicle will be the small SamSpace-218D CubeSat, ejected before the two large passengers are separated simultaneously, pushing off into opposite directions to avoid re-contact. Lomonosov and AIST-2D are aiming for an orbit of around 510 Kilometers, inclined 97.3 degrees to be dropped off by Volga before the upper stage completes deorbit maneuvers, setting up for re-entry in the Pacific six to eight hours after launch. 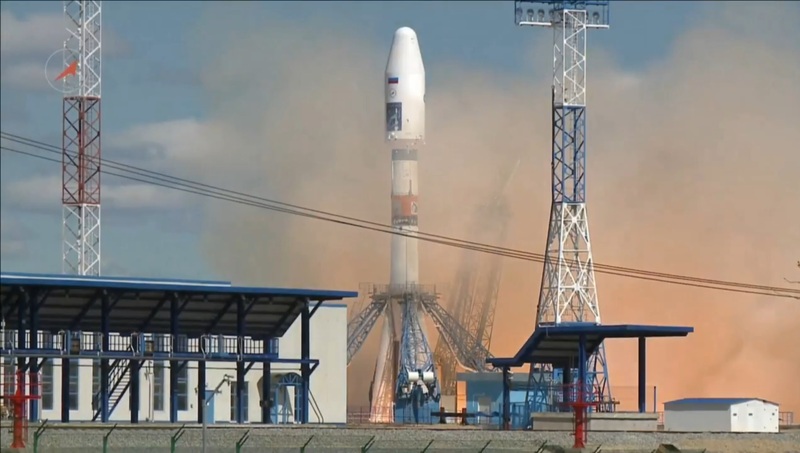 The three satellites delivered to orbit by Soyuz – amounting to a payload mass of one metric ton – will serve a multitude of functions from technical demonstrations to research in diverse areas of science. The 450-Kilogram Lomonosov satellite is outfitted with a range of sensors to observe gamma-ray bursts by simultaneous spectral measurements and imaging. 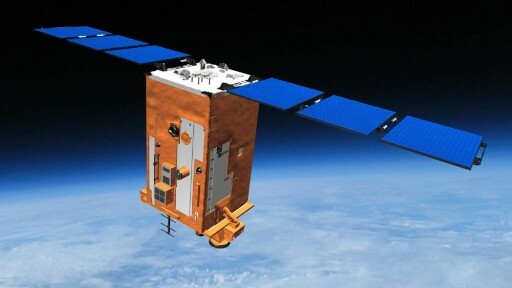 Other instruments will study the particle and magnetic environment in near-Earth space and dedicated sensors will look at high-energy phenomena in Earth’s atmosphere including Transient Luminous Events and high-energy air showers caused by cosmic rays. AIST-2D, weighing in at 531 Kilograms, carries eight payloads highlighted by an experimental hyperspectral imager to demonstrate a compact system for the collection of high-resolution multispectral Earth imagery, and a novel P-Band radar capable of peering beneath vegetation and studying subsurface targets to a depth of several meters. The satellite also hosts materials science experiments, a Microacceleration Control System demo, a space-to-space communications terminal and a Mass Spectrometer. SamSat-218D is a 4-Kilogram CubeSat developed by students at the Samara State University to conduct a demonstration of an aerodynamic stabilization system and a Globalstar Communications Terminal for small-satellite communications.